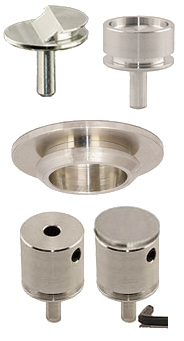 We offer a comprehensive choice of standard pin stubs to support virtually all applications. The standard SEM pin stubs are compatible with Thermo Fisher, FEI, Philips, Tescan, Phenom, Aspex, RJLee, AmRay, Cambridge Instruments, Leica, CamScan, Aspex, ETEC and Novascan SEMs. They are made from vacuum grade aluminium. They are machined according to the original manufacturer's specifications and dimensions. The flat pin stubs from 12.7mm to 38mm diameter are grooved for easy and clean handling. The most used pin stubs are the Ø12.7 mm and the Ø25.4 mm pin stubs. Pins are all 3.2mm diameter with a length of either 8mm or 9.5mm. The Ø12.7 mm pin stubs are also available in brass, copper and high purity carbon. Special 12.7mm stub diameter with a flate side and 12.7mm stub in brass and copper. 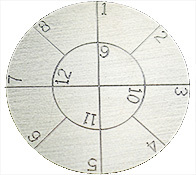 Engraved pin stubs with lines and numbers for mounting multiple samples or for relocating a sample. Stub diameters are 12.7, 19, 25.4 and 32mm. 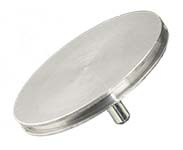 Swivel pin mount with a top diameter of 15mm which can be tilted 90º both ways. 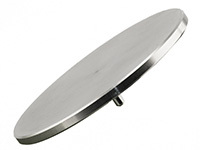 Dish cylinder stub with 12.7mm stub diameter for sample preparation of solutions or fluids directly on the stub. The dish design prevent fluid from dripping of the stub. Sample can be dried on the SEM stub. Cambridge S4 stub, which is not a pin stub but used on many SEMs with pin stubs. 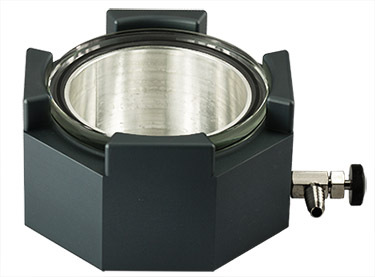 A Cambridge S4 holder or Cambridge S4 adapter is needed for the Cambridge S4 stub. SEM pin stub extenders to quickly adjust height and bring samples closer to the polepiece. If you need an SEM sample pin stub which is not offered in the list below, please contact us. We can manufacture custom sample stubs or suggest a solution with other sample stubs.